For the politician, see Lee Jong-seok (politician). Lee Jong-suk (Hangul: 이종석, born September 14, 1989) is a South Korean actor and model. He debuted in 2005 as a runway model, becoming the youngest male model ever to participate in Seoul Fashion Week. Lee's breakout role was in School 2013 (2012) and he is also well known for his roles in I Can Hear Your Voice (2013), Doctor Stranger (2014), Pinocchio (2014), W (2016), While You Were Sleeping (2017), The Hymn of Death (2018) and Romance Is a Bonus Book (2019). Lee majored in Professional Motion Pictures and Art at Konkuk University and graduated from the university in 2016. At 16, Lee began his modelling career at the Seoul Collection walkway in 2005, making him the youngest male model to debut in the Seoul Collection program at Seoul Fashion Week. Since then, he has walked in a number of fashion shows. Lee trained as an idol group member for three months, and had signed on with an agency to debut. However, he quit after the agency broke their promise of debuting him as an actor. He took part in a selection for actors at SBS TV station when he was in middle school. In 2010, Lee made his official acting debut in the South Korean TV series Prosecutor Princess. He also made his big-screen debut in the horror movie Ghost. Lee started to gain recognition following his supporting role in the hit drama Secret Garden where he played a talented young composer with a surly attitude and a forbidden crush on the second male lead. In 2011, he appeared in MBC's sitcom High Kick Season 3 where he gained further popularity. Lee also co-starred in the film R2B: Return to Base in 2012, a loose remake of the critically acclaimed 1986 film Top Gun. Lee's breakout role came as a high school student in the teen drama School 2013. He received his first acting award for the role at the 2012 KBS Drama Awards under the category Best New Actor. He also ranked fifth according to a survey entitled 'Actors Who Lit Up 2013' by Gallup Korea. Following the success of School 2013, Lee starred in the critically acclaimed drama series I Can Hear Your Voice with Lee Bo-young. He played Park Soo-ha, an intelligent young man who can read minds. Originally slated for 16 episodes, the drama was extended by two episodes due to its successful ratings. He received the Excellence Award in the male category at the Korea Drama Awards for his performance. Lee then starred in the sports film No Breathing and had a supporting role in the box office hit The Face Reader. In 2014, he starred in teen romantic comedy Hot Young Bloods, playing a cheesy womanizer. Lee then starred in hit medical drama Doctor Stranger, playing a North Korean defector who works as a doctor in South Korea. The drama was a success in China, gaining 400 million views. Lee next starred in Pinocchio opposite actress Park Shin-hye, and played the protagonist Choi Dal-po, a first year reporter at a broadcasting company who struggles with the idea of justice and truth in a world where everyone wants to hide the facts. Pinocchio was another hit, with a reported revenue of 6.2 billion won (US$5.62 million) for broadcasting rights in just one year. 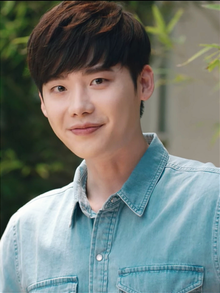 Lee's performances in the dramas Doctor Stranger and Pinocchio earned him acting accolades, including the Male Top Excellence Award at the 8th Korea Drama Awards. He also became the youngest actor to win the Best Actor award at the 27th Grimae Awards, chosen by television cinematographers. Lee then embarked on an Asia fan-meeting tour, and released a photobook titled 2014-2015 Asia Tour Story ~With~, comprising photos taken of Lee's meetings with fans in seven Asian cities during the nine-month tour. Lee was also cast in his first Chinese drama entitled Jade Lovers alongside actress Zheng Shuang. The drama, filmed in Shanghai, is described as a fantasy romance series set in the 1930s. Due to Lee's success in China, a wax figure of him went on display in Hong Kong's Madame Tussauds, which the actor unveiled himself in a ceremony. In December 2015, Lee left his previous agency Wellmade Yedang and signed an exclusive contract with YG Entertainment on May 10, 2016. In July 2016, Lee returned to the Korean small screen with MBC's fantasy thriller W alongside Han Hyo-joo. The drama topped popularity charts in Korea and Lee won the Daesang (Grand Prize) at the year-end MBC Drama Awards. The same year, he co-starred in the promotional web drama First Seven Kisses for Lotte Duty Free. In 2017, Lee starred in the crime film VIP, marking his first lead role as a villain. Lee then starred in the supernatural-procedural drama While You Were Sleeping alongside Bae Suzy in September. In July of the same year, Lee was appointed Goodwill Ambassador for Korean tourism by the Korea Tourism Organization. The organization also released promotional videos featuring the actor, titled "8 Episodes of Korea", which focused on tourist spots in 10 different regions including Seoul, Gyeonggi, Gangwon, Jeju and Gyeongju. In 2018, Lee was cast in the two-episode drama The Hymn of Death, a remake of the 1991 film Death Song. Lee signed with new management agency YNK Entertainment once his contract with YG Entertainment ended, but terminated his contract five months later. In 2019, he starred in his first romantic comedy drama Romance Is a Bonus Book alongside Lee Na-young. Lee is best friends with fellow model-actor and School 2013 co-star Kim Woo-bin, whom he has known since their modeling days. He is the owner of the dining cafe, 89Mansion. ^ Kim, Ji-young (February 21, 2016). "Lee Jong-suk graduates Konkuk Univ". Kpop Herald. Retrieved February 26, 2016. ^ "Models rushing to small screen". The Korea Times. March 21, 2014. Retrieved March 9, 2017. ^ "Lee Jong-suk emerging as new Asian star". Korea Times. May 28, 2014. Retrieved March 9, 2017. ^ "Lee Jong Seok Says He Can't Call Himself an Actor Yet". enewsWorld. September 2, 2012. Retrieved March 9, 2017. ^ "이종석-손동운 건국대 정시모집 합격...네티즌 "얼굴만 잘 생긴게 아니었네"" (in Korean). Nate. February 1, 2011. Retrieved March 9, 2017. ^ "[INTERVIEW] Actor Lee Jong-suk". 10Asia. December 7, 2010. ^ "Actor Lee Jong-suk's Song Picks". 10Asia. January 7, 2011. ^ "MBC 일일시트콤 하이킥! 짧은 다리의 역습 메인 페이지". Imbc.com (in Korean). Retrieved March 9, 2017. ^ "Lee Jong Seok Says 'High Kick 3' was the Jewel of His Life". enewsWorld. March 29, 2012. Archived from the original on September 7, 2017. ^ "[Interview Part I] The Pretty Boy Lee Jong Seok Takes a Turn with 'R2B'". enewsWorld. September 2, 2012. Archived from the original on September 7, 2017. ^ Ho, Stewart (October 29, 2012). "Lee Jong Seok, Kim Woo Bin, Park Se Young, 5dolls' Hyoyoung Cast as Main Students for School 5". enewsWorld. Archived from the original on August 21, 2017. ^ "Lee Jong-suk Unveils Still-shots from KBS "School 2013"". 10Asia. November 27, 2012. ^ a b "Big Winners of 2012 Announced at Drama Awards Ceremonies of Major Broadcasters". 10Asia. January 1, 2013. Archived from the original on April 15, 2014. ^ "이보영·지성 부부, 2013년을 빛낸 탤런트 1·2위" [Newlyweds Lee Bo Young and Ji Sung rank #1 and #2 in survey for ‘Actors Who Lit Up 2013’]. Star News (in Korean). December 17, 2013. ^ "Drama gives 'Voice' to unique storylines". Korea JoongAng Daily. July 5, 2013. ^ Lee, Eun-ah (July 17, 2013). "Lee Jong-suk's I Can Hear Your Voice Extended by 2 Episodes". 10Asia. Archived from the original on March 28, 2014. ^ a b "Lee Jong-suk, Kim Dong-wan and Seo Hyeon-jin receive awards". Hancinema. TV Daily. October 2, 2013. ^ Sunwoo, Carla (October 25, 2013). "Actors take plunge into swimming roles". Korea JoongAng Daily. ^ Tae, Sang-joon (August 14, 2013). "Director and Stars Gather for THE FACE READER Press Conference". Korean Film Council. ^ "Lee, Park to star in 'Boiling Youth'". The Korea Times. August 8, 2013. ^ "Lee Jong-suk Sets Hearts Racing as Country Bumpkin in New Comedy". The Chosun Ilbo. August 24, 2014. ^ "Lee Jong-suk to Play Doctor in New Drama". 10Asia. February 5, 2014. ^ "Actors picked for 'Pinocchio'". Korea JoongAng Daily. November 8, 2014. ^ "Lee Jong-suk Finds Acting Harder as He Gets More Famous". The Chosun Ilbo. February 21, 2015. Retrieved March 6, 2015. ^ "Cultural Exports to Surpass 1 Trillion Won This Year". Business Korea. December 26, 2014. ^ "'Pinocchio' sells distribution rights to China for record price". Kpop Herald. November 24, 2014. ^ a b "Lee Jong-suk and Kim Tae-hee win Best Actor, Best Actress awards respectively: Korea Drama Awards 2015". Hancinema. Star News. October 9, 2015. ^ "Lee Jong-suk, the youngest to the Grimae Awards". Hancinema. Sports Donga. December 8, 2014. ^ "Actor Lee Jong-suk's photo book to go on sale overseas". Yonhap News Agency. July 29, 2015. ^ "Actor Lee Jong-suk cast for S. Korean-Chinese drama". Yonhap News Agency. December 23, 2015. ^ "Actor Lee Jong-suk's wax figure to be unveiled in Hong Kong". Yonhap News Agency. January 21, 2016. ^ "Actor Lee Jong-suk signs with YG". Korea JoongAng Daily. May 11, 2016. ^ Kim, Soo-hyang. "Lee Jong-suk and Han Hyo-joo in new drama 'W'". Kpop Herald. Retrieved April 7, 2016. ^ "Cartoon hero meets doctor in new sci-fi drama". Yonhap News Agency. July 18, 2016. ^ "Sci-fi drama 'W' takes top spot on CPI chart". Yonhap News Agency. August 2, 2016. ^ a b "[MBC 연기대상] 맥락 있는 시청자 선택=이종석…안방점령 'W' 7관왕(종합)". JoongAng Ilbo (in Korean). December 31, 2016. ^ "[단독]이종석·이준기·지창욱·박해진 뭉쳤다…'첫키스만 여섯번째' 출연". News1 (in Korean). Retrieved November 2, 2016. ^ Jin Min-ji (August 20, 2016). "Actor Lee Jong-suk confirmed for 'VIP'". Korea JoongAng Daily. ^ "Lee Jong-suk Shows His Dark Side in Latest Crime Thriller". The Chosun Ilbo. September 2, 2017. ^ "Lee Jong-suk to play prosecutor in next drama". Kpop Herald. Retrieved 2016-11-16. ^ "Lee Jong-suk, Su-zy to Star in New TV Series This Fall". The Chosun Ilbo. August 5, 2017. ^ Kim, So-yeon. "Lee Jong-suk named honorary ambassador for Korea Tourism". Kpop Herald. Retrieved July 28, 2017. ^ "Lee Jong-suk, Shin Hye-sun to appear in 'Hymn of Death'". Kpop Herald. November 2, 2018. ^ "Lee Jong-suk to star in new two-part SBS series". Kpop Herald. March 13, 2018. ^ "Lee Jong Suk to Set Up His Own Agency Partnering with YNK Entertainment". SBS News. April 3, 2018. ^ "Lee Jong-suk walks away from YNK". Korea JoongAng Daily. October 16, 2018. ^ "Lee Na-young and Lee Jong-suk to show romance in publishing industry in new rom-com". Kpop Herald. January 21, 2019. ^ Choi, EunHwa (October 22, 2013). "Lee Jong Suk says Kim Woo Bin is the Only Friend He Can Lean On". enewsWorld. Archived from the original on 28 February 2014. Retrieved April 7, 2016. ^ Kim, Soo-hyang (June 23, 2016). "Strong friendships among male celebrities". Kpop Herald. ^ "LOOK: Korean actor Lee Jong-suk has a cafe in Seoul". ABS CBN. March 6, 2018. ^ "Lee Jong-suk is reporting for duty". Korea JoongAng Daily. February 27, 2019. ^ "Actor Lee Jong-suk leaves for alternative military service". The Korea Times. March 8, 2018. ^ Kim, Jin-suk (February 26, 2019). "[단독]"잠시 안녕…" 이종석, 3월 8일 대체 복무 시작". IS Plus (in Korean). ^ "Gaon Chart". Gaon Chart (in Korean). ^ "Who Took Home a Prize at the Style Icon Awards?". enewsWorld. November 4, 2011. ^ "Winners at the 2013 Korea Drama Awards". The Manila Bulletin. October 3, 2013. ^ "Lee Jong Suk Accepts Award at 2013 Style Icon Awards". enewsWorld. October 24, 2013. Archived from the original on September 7, 2017. ^ "제21회 대한민국문화예술연예대상시상식 수상은 누구에게..." JMBC (in Korean). November 30, 2013. ^ "'그겨울' 송혜교, 대전드라마페스티벌 '대상' 영예". Star News (in Korean). November 16, 2013. ^ Cory Lee (January 2, 2014). "Lee Bo-young Grabs 1st Top Prize at the 2013 SBS Drama Awards". 10Asia. ^ "2014 Asia Model Awards 'Model Star Award (Korea) Han Go Eun & Lee Jong Suk'". AMFOC. Retrieved March 11, 2018. ^ "'You Who Came from the Stars,' Lee Jong Suk and Song Yoon Ah Win Big at Grimme Awards". enewsWorld. December 8, 2014. ^ a b c "SBS Drama Awards 2014 Winners". HanCinema. December 31, 2014. ^ Yoon, Sarah (May 27, 2015). "Lee Min-ho, Park Shin-hye, Lee Jong-suk win Most Popular awards". K-pop Herald. ^ "이민호·이종석, 중국인이 뽑은 한류★ '올해의 브랜드'". My Daily (in Korean). October 7, 2015. ^ "Park Shin-hye, Lee Jong-suk awarded at 2015 KPCAA". Kpop Herald. October 30, 2015. ^ "MBC Drama Awards 2014 to Decide Grand Prize Winner through Real Time Text Voting". OSEN. ^ "Lee Jong-suk Wins Top Excellence Actor Award at '2017 SBS Drama Awards'". SBS News. January 2, 2018. ^ "SBS Drama Awards 2017: Defendant star Ji Sung bags grand prize; complete winners list". International Business Times. December 31, 2017. 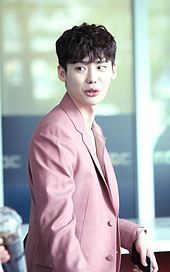 Wikimedia Commons has media related to Lee Jong-suk.